We have been suppliers of Promotional Calendars, 2018 diaries, UK corporate gifts and desktop items for over 20 years. Corporate Company gifts are the ideal way to subtly keep your brand name and logo in front of your customers. It's always nice to give or receive a freebie Corporate Gift and it helps to build a connection between buyer and seller. Maintaining good relationships with customers is just as important as chasing new business. 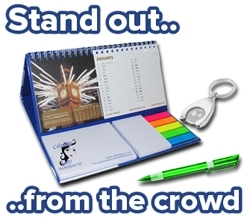 The promotional marketing game is easy, 'Just give your customers a gift that reminds them of you'. If you can get your logo on their desk, bunch of keys or clothing is even better ! Have you got an exhibition this year? We can help you promote your business at your next exhibition or Conference. Give potential new customers a Logo Branded Freebie so that they remember you. Sweets, Pens, Business Cards, Keyrings and Stickers are all good promotional tools that help to get your name out there. Given out with a flyer and a smile, is slightly more exciting than just a pile of flyers on the table. Perfect as a business gift for any Company - Our Personalised 2018 Calendars are superb for brand-name exposure and brand-awareness. We have Corporate Clothing in stock with embroidered logo branding, Branded Pens for your personalised stationery requirements, and even Logo Branded Keyrings to hand-out to customers along with an invoice. For any quotations that you require on a wide range of products simply fill in our contact form or phone us on 01989 565281. We will ALWAYS make contact with you by phone to confirm of your enquiry details and ALL orders receive a free proof of design. If you want ideas about how to promote your business, you've definitely come to the right place. Business executives buy over 10 billion pounds worth of promotional products every year (worldwide). Each one of these purchases is a subtle method of effective advertising. Each pen with your logo on or 2018 calendars brings your company one step closer to securing another deal and more sales, which will help you to achieve more income. View our full Personalised Umbrella range, Radiator Boosters, Personalised Bowhead Flags, Promotional Power Banks, Post-it Note Combi Set and Chepstow Printers here.